Coats Mercer-Crochet Cotton no.40 (20 grm): 2 balls selected colour. Milward steel crochet hook 1•00 (no. 4). (If YOur crochet is loose use a size finer hook, if tight use a size larger hook). 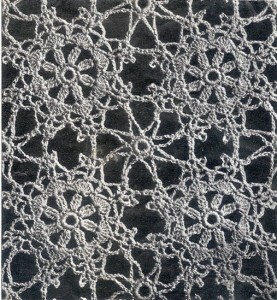 Size of Motif: 5 em (2 in) in diameter, from picot to picot. Measureinellts: 20’5 em X 61 em (8 in X 24 in) . 4 motIfs X 12 motifs. FIRST MOTIF Commence with 8 ch, join with ss to form a ring. 1st Row: Into ring work 16 dc, 1 ss into first dc. 2nd Row: 4 ch, 2 dbl tr into same place as last ss leaving the last loop of each on hook, thread over and pull tlll-ough all loops on hook (a cluster made), * 5 ch, miss 1 dc, a 3 dbl tr cluster into next dc; repeat from * ending with 5 ch, 1 ss into top of first cluster. 3rd Row: 3 ch, 6 tr into same place as last ss, * 1 dc into 5 ch sp, 7 tr into top of next cluster; repeat from * ending with 1 dc into last 5 ch sp, 1 ss into 3rd of 3 ch. 4th Row: 1 ss into each of next 2 tr, * 1 dc 5 ch and 1 dc i\lto next tr, 5 ch, 1 dc into next dc, 5 ch, miss 3 tr; repeat from * ending with 1 ss into first dc. 5th Row: 1 ss into next ch, 1 ss into 5 ch loop, 7 ch, 1 dc into 4th ch from hook (picot made), * (1 tr into same loop, 4 ch, 1 dc into 4th ch from hook-a picot made) twice, 1 tr into same loop, 3 ch, 1 dc into each of next two 5 ch sps, 3 ch, 1 tr into next 5 ch loop, picot; repeat from *. omitting 1 tr and 1 picot at end of last repeat, 1 ‘ss into 3rd of 7 ch. Fasten off. 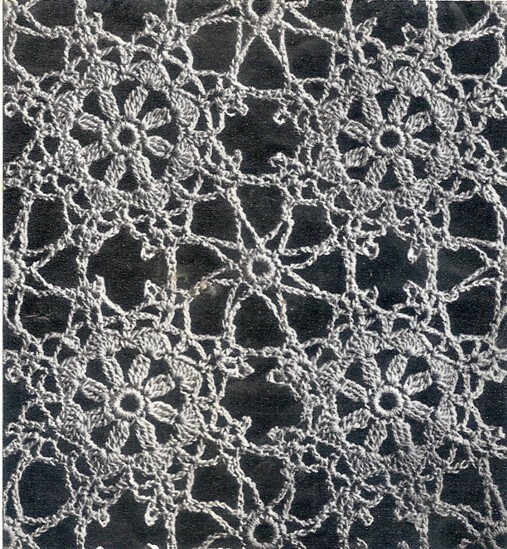 SECOND MOTIF Work same as first motif for 4 rows.5th Row: 1 ss into next ch, 1 ss into 5 ch loop, 7 ch, 1 dc into 4th ch from hook, 1 tr into same loop, 2 ch, 1 ss into cor¬responding picot of first motif, 2 ch, 1 dc into ch after last tr on second motif, 1 tr picot and 1 tr into same loop on second motif, 3 ch, 1 dc into each of next two 5 ch sps, 3 ch, I tr picot and I tr into next ,5 ch loop, 2 ch, 1 ss into corresponding picot of first motif, 2 ch, 1 dc into ch after last tr on second motif and complete as for first motif (no more joinings). Make necessary number of motifs joining two points of one motif to two points of adjacent motif as second was joined to first. FILLINGS Commence with 8 ch, join with a ss to form a ring. I St Row: Into ring work 16 dc. 2nd Row: I dc into first dc, 5 ch, I dc into free picot of motif, * 5 ch, miss I dc on first row of filling, 1 dc into next dc, 5′ ch, 1 dc into next free picot on same motif, 5 ch, miss 1 dc on first row of filling, 1 dc into next dc, 5 ch, I dc into free picot of next motif; repeat from * ending with 1 ss into first dc. Fasten off. Fill in all spaces between motifs in same manner. Damp’ and pin out to measurements.